We come to you, have the Initial Consult in your home with a Hippie Dog Trainer. Look over the trainers bio to find the right fit. Or, click skip for the best availability. 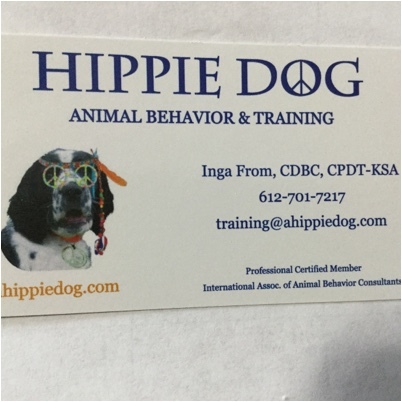 (If your pet is having serious behavioral concerns, you will need to book with Inga. She does not offer in-home Apts. We come to you. One-on-one training lesson in your home. (All new clients must first book an initial consult to use this service). Book a package with your trainer to get a discounted rate. Client Set Up Fee (includes an in-home consult) 30 mins. Prior to starting training walk services, your dog's new walker/trainer will meet you for an in-home consultation. We discuss your dog's likes, dislikes, training history, exercise habits, and medical history so that we can create a customized plan, ensuring that your dog's specific needs are met during each visit. Training Walks- Does your dog need some exercise, training & a potty break during the day while you're at work? We will help your dog work on Loose Leash Walking, Come, Watch Me and basic overall good walking manners. All reward based of course. Training Walks- Does your dog need some exercise, training and a potty break during the day while you're at work? We will help your dog work on Loose Leash Walking, Come, Watch Me & basic overall good walking manners. All reward based of course.